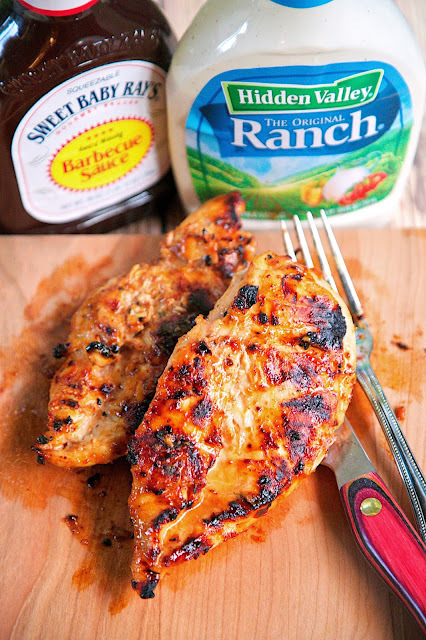 BBQ Ranch Grilled Chicken - only 3 ingredients (including the chicken) - super simple marinade that packs a ton of great flavor! Quick, easy and delicious - my three favorite things! This recipe was inspired by the Roasted Garlic Italian Grilled Chicken we posted in July. We loved the flavors and the simplicity of that recipe. I decided to give a BBQ Sauce and Ranch mixture a try. OMG! 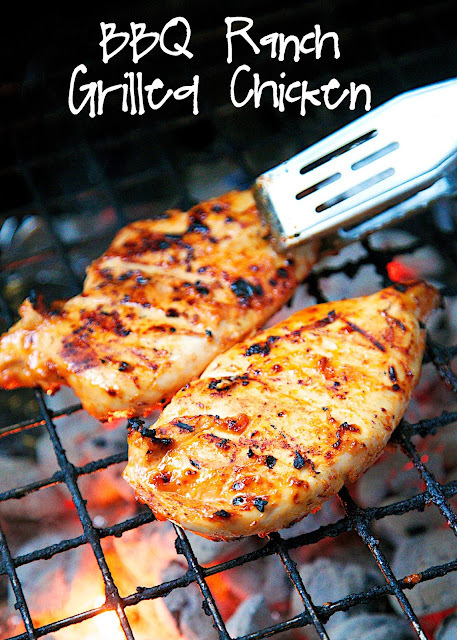 Stop what you are doing and add this chicken to your menu this weekend! It is SO good. I let the chicken hang out in the fridge all day before we grilled it. I usually marinate all my chicken the night before we grill it to get the maximum amount of flavor. This chicken was so delicious. It is great on its own or sliced in a quesadilla or on top of a salad. We will double the recipe next time so we have leftovers. We've made this several times. We just can't seem to get enough of it! Combine Ranch Dressing and BBQ sauce. Pour over chicken and let marinate in refrigerator 4 hours to overnight. Grill chicken approximately 15 minutes, or until done. Can you bake in the oven? How long, and what temp, please? Looks yummy! I suggest pan searing the chicken on both sides for about 3 minutes and then finishing it in the oven at 425 for about 10 minutes. Stephanie@Plain Chicken Silly question. Do you sear it with the Ranch & BBQ already in it? Yes - let the chicken soak in the bbq & ranch mixture and then cook it. Looks like rain is forecast for the evening so I may not be able to grill tonight, but I’ve already got it soaking in the marinade. I’m using 5 chicken tenders instead, so do you still advise pan-searing first? It is up to you. I don’t usually sear chicken tenders before baking in the oven.